Some people try to solve the impossible equation with the myth of dematerialisation: the claim that as processes become more efficient and gadgets are miniaturised, we use, in aggregate, fewer materials. There is no sign that this is happening. Monbiot’s argument is wrong. I dug out a nice oddball paper on dematerialization by Austrian scholar Julia K. Steinberger et al, Development and Dematerialization: An International Study, in online peer-reviewed journal PLoS ONE. Snark if you like, but read it first. They used standardised material flow data still produced by national statistics agencies (perhaps in response to Leontief’s input-output analysis). The three basic categories – fossil fuels, biomass, and minerals – are aggregated by weight into “domestic material consumption”, DMC. It’s a measure of the mass of material resources we consume. Not very helpful for helium and yttrium, but these are of marginal importance. The chart over the jump shows the trends for a good number of rich and developing countries. 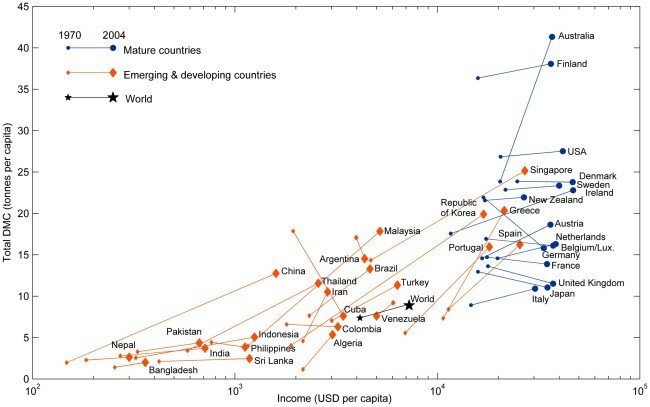 Our intuition is that as countries get richer, their growth becomes less resource-intensive, and the link may indeed go into reverse. The data clearly support this proposition. A significant number, including France, Germany, Japan, the Netherlands, and the UK, had a negative elasticity of material consumption against income. Germany had an astonishingly large one (-0.4), which reunification with the inefficient DDR (a five-year shock) can only partly explain. The USA was flat. Among advanced countries, only Australia, Austria and Ireland showed a large increase. Dematerialized growth is already here. Machinery like cars is getting better and longer-lived; electronic gadgets get smaller – the $500 iPhone, more powerful than a 5 kg desktop computer of 1990, weighs 112 grammes; we consume more restaurant meals, online entertainment, and concerts. There is little reason to think these trends will be reversed. Indeed, Steinberger’s data stop before anybody got serious about climate change and started investing in renewable energy. Since 2004, over 140 GW of solar panels have been installed, and the total is growing by 40-50 GW a year. Monbiot’s doomsday argument fails. We do not face an impossible dilemma of global “limits to growth”. What we do have is a limited problem, but a real, large and difficult one. Developing countries are still increasing their material consumption, and rapidly. They will clearly stop doing so, at or before current OECD levels of income per head. Similarly global population will very probably plateau, maybe around 10 billion. That many humans at current German or Japanese levels of material consumption is still a huge increase in annual claims on natural resources. The burning of fossil fuels has to stop completely, and soon, to save a livable climate. There remain huge problems over creating a sustainable food supply while preserving or increasing the remaining forests. The cultural shift among young people, away from cars as foci of aspiration towards instant communication, should be welcomed and encouraged. Countries addicted to suburban sprawl, like the USA and Australia, will need to shift back to European densities of urban living. It looks difficult, but not impossible, to live and prosper within our global means. In the long run, is an economy of immaterial scarcity plausible? The material base of living will always be there, but as a steadily decreasing share of expenditure. At some point the administrative hassle of charging for ball-point pens, T-shirts and 3D-printed toasters ceases to be worth it, and communism becomes less trouble. At the other end of the scale, the best seats for grand opera and duplexes overlooking Central Park will always be scarce and their price has no natural limit. A society where the mass of Morlocks live off an adequate dole of bread and e-circuses and the few Eloi compete like Renaissance princes for positional goods is not attractive, and looks uncomfortably close – but it can be ecologically sustainable. The title refers to Prospero’s great envoi.